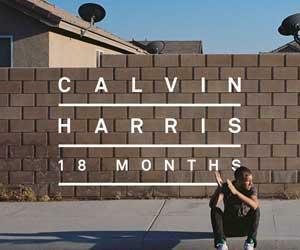 NEW CALVIN HARRIS ALBUM “18 MONTHS” TO BE RELEASED OCTOBER 30TH! Many things can happen in 18 months. For Scottish-born, international DJ/producer CALVIN HARRIS, he garnered two MTV Video Music Awards, earned a platinum-selling single for “Feel So Close” and performed at many major music festivals including Coachella, Lollapalooza, Ultra Music Festival and iTunes Festival, just to name a few. However, the greatest accomplishment for him during this time period was the completion of his new album 18 MONTHS, out October 30 (Roc Nation/Ultra Music/Columbia Records). 18 MONTHS features a star studded line-up, with guest vocals from the likes of Rihanna, Kelis, Ne-Yo, Florence Welch, Dizzee Rascal, Ellie Goulding, Tinie Tempah, Ayah and Example, as well as collaborations with DJ/producers Nicky Romero and Dillon Francis. It is the follow-up to HARRIS’ 2009 #1 album Ready For The Weekend. “Sweet Nothing” will be the sixth single from the album so far, following HARRIS’ collaborations with Rihanna (the international smash hit “We Found Love” which HARRIS wrote and produced for her 2011 album Talk That Talk) and Kelis (“Bounce”), his smash radio track “Feel So Close” and collaborations with Ne-Yo (“Let’s Go”) and Example (“We’ll Be Coming Back”). Upon its release as a single (date TBA), “Sweet Nothing” will also feature remixes by Tiësto, Burns, Dirtyloud and Qulinez. With international album sales of over 3.2 million, singles sales from the tracks taken from 18 MONTHS are already up to 2.2 million worldwide. In Canada, “Feel So Close” has already achieved triple-platinum status and “Let’s Go” is close to reaching platinum with 70,000+ in sales, all the while remaining on Billboard’s Hot 100—“Feel So Close” peaking at #9 and “Let’s Go” at #19—and receiving heavy play on Top 40 stations across the country.